la desigualdad de las Estaciones y de los Dias. 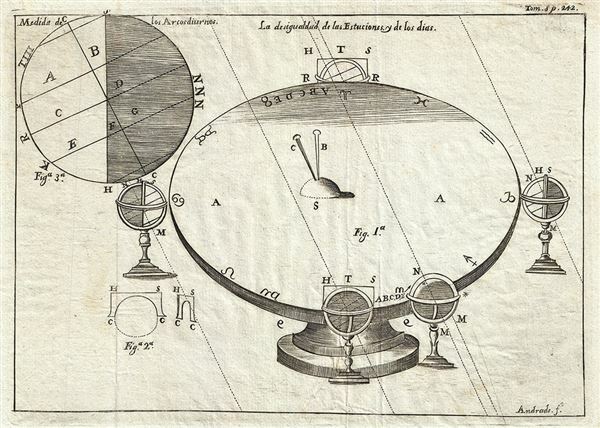 This is a fine example of the 1754 illustration of a sundial by Gabriel Ramirez. The chart includes three figures. The first figure of the sundial, a device used to tell the time of the day based on the Sun's position by casting a shadow on a surface marked with the hours of the day. The second figure measures the daytime arches. Originally prepared in French by Abbot M. Pluche and translated into Castilian Spanish. Engraved by Jose Andrade for publication in Volume VII, Part 4 of D. Gabriel Ramirez's Espectaculo de la Naturaleza, O Conversaciones a Cerca de Las Particularidades de la Historia Natural. Very good. Original platemarks visible. Minor wear along original fold lines. Minor creasing. Blank on verso.